Richard Rodgers and Oscar Hammerstein II were Broadway folk who didn't particularly like Hollywood, but Hollywood loved R&H. For 20 years, from 1945 to 1965, the duo's Broadway career spilled over into such movie hits as OKLAHOMA!, CAROUSEL, SOUTH PACIFIC, THE KING AND I, and FLOWER DRUM SONG. Their first Hollywood venture, STATE FAIR (1945) was written expressly for the big screen (and earned an Academy Award for Best Song, inspiring the trivia question heard again every March: ""Name the only Oscar to win an Oscar."") R&H's last musical, THE SOUND OF MUSIC, was their cinematic triumph, winning five Oscars including Picture of the Year, and still on top as the most successful movie musical ever. Of special note are a trio of films made during the '50s, as beloved today as they were during their first, eagerly awaited releases: OKLAHOMA! (1955), THE KING AND I (1956), and SOUTH PACIFIC (1958). Dazzling star performances from the likes of Shirley Jones, Gordon MacRae, Mitzi Gaynor, Rossano Brazzi, Deborah Kerr and Yul Brynner contributed to their appeal; so did sumptuous design and breathtaking vistas (with Arizona standing in for Oklahoma, the Hawaiian island of Kauai for the South Pacific, and a Hollywood backlot for Bangkok). To be certain their scores made the transition from stage to screen properly, Rodgers & Hammerstein encouraged lush, orchestral soundtracks that continue to shimmer after nearly half a century. Orchestrations were scored by some of the leading Hollywood and Broadway craftsmen of their day: Robert Russell Bennett, Edward B. Powell, Gus Levene, Pete King, and Bernard Mayers. As a result of their work, all three of these films received Academy Award nominations for ""Best Scoring of a Musical Picture,"" with OKLAHOMA! and THE KING AND I taking home the gold. Now for the very first time, The R&H Concert Library is pleased to make these orchestrations available for symphonic orchestra and voice. ""John Mauceri [Principal Conductor of the Hollywood Bowl Orchestra] has been a champion of these film orchestrations for years,"" says R&H President Ted Chapin. ""When he plays them, Mauceri reminds his audiences that while Broadway orchestrations are constrained by the size of the pit, Hollywood versions are limited only by the size of the budget. And, after all, what were ten more violins to the budget of a spectacle like THE KING AND I? The end result,"" concludes Chapin, ""is a sound that is pure Rodgers & Hammerstein - but widescreen and Cinemascope in feeling."" In 1992, John Mauceri and the HBO brought the charts from THE KING AND I back to life, joined to the dream casting of Julie Andrews and Ben Kingsley for a Philips Classics studio recording. In a 1996 tribute to great movie musicals, the HBO played the film orchestrations for both ""The March of the Siamese Children"" from THE KING AND I, and the ""Dream Ballet"" from OKLAHOMA! The next summer, the HBO presented most of the OKLAHOMA! score in a unique pairing of the film orchestrations with such country & western stars as Billy Dean and Crystal Bernard. Last summer, the movie orchestrations from SOUTH PACIFIC got the HBO treatment, aided by guest vocalists Susan Egan, Justino Diaz, Davis Gaines and Marilyn Horne. Each of these concerts was rapturously received by critics, film buffs and R&H fans alike. And no wonder: ""These orchestrations are glorious,"" says Chapin, ""and so we are thrilled to make them available to orchestras the world over."" 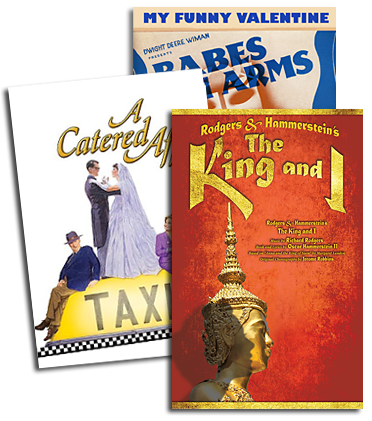 The original film orchestrations from OKLAHOMA!, SOUTH PACIFIC and THE KING AND I are now available from The R&H Concert Library for symphonic orchestra and voice...Contact the Library by phone (212-268-9300), fax (212-268-1245),or e-mail (concert@rnh.com).